Located opposite King George Square and City Hall, Pullman Brisbane King George Square is ideally situated in the heart of Brisbane. Guests staying at this exceptional Brisbane hotel are just a short distance from many of the city's major attractions, as well as buses, ferries and trains via nearby Central and Roma Street stations. Queen Street Mall, Roma Street Parklands and the CBD are all within walking distance, while Southbank and Eagle Street Pier with all its restaurants and bars are also closeby. Named Lonely Planet's 'hippest city', Brisbane is the place to be. 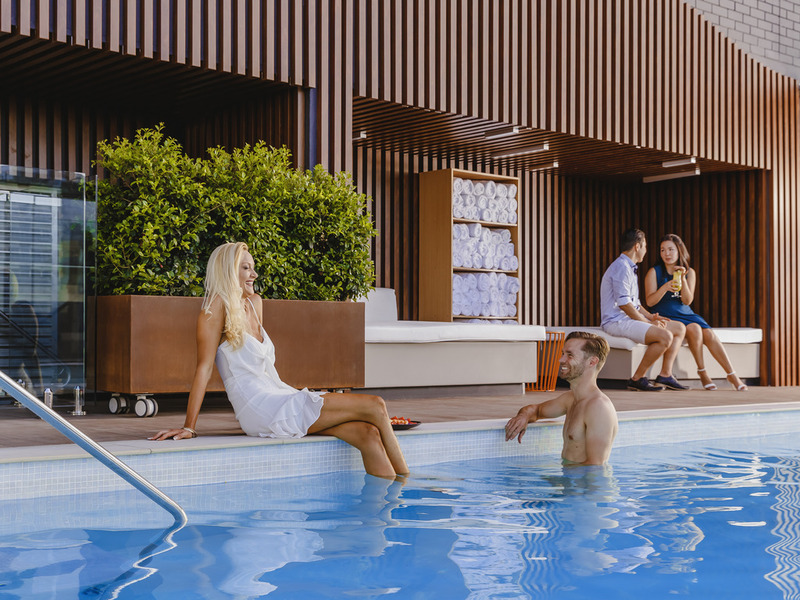 Stay at Pullman Brisbane King George Square to discover Brisbane's new laneways, its art exhibitions, free public events and festivals, and its vibrant Cultural Centre and Southbank. Offering 5-star accommodation in the heart of Brisbane, Pullman Brisbane King George Square features a range of room styles, including Deluxe, Executive and Spa Suite options. Spacious and contemporary, each room is elegantly appointed, featuring an array of luxurious touches. Guest room features at this stylish Brisbane hotel include a large bathroom with dual basins and CO Bigelow Apothecaries bath products, large windows with blackout curtains, a TV with cable channels, a work desk and Wi-Fi access. Be seen at the vibrant KG Bar a sleek and funky Brisbane bar with an alfresco terrace.A lively meeting spot this Brisbane city bar offers a seductive mix of edgy furnishings live entertainment on selected nights an impressive wine and cocktail menu. Checked in Sunday, felt welcome and expected. I had a medical episode on the Monday morning - viral vertigo - and needed to call ambulance. the assisitance and attendence form hotel was fantastic with Aroon (?) and Stuart (concerige) both very attentive, caring and following up with needs and requirements. Brilliant!!. checked out on Wednesday again with care and consideration from Stuart and check out staff. All was well by Thursdaya nd finally home on Thursday. Having an issue liek this - unexpected and unforeseen and away from familiar hospitals/people/care is very disconcerting to say the least and the care and empthay shown by thte key staff whom new was a very comforting thing to Karen and myself. Thank you!!! Breakfast was great, overpriced vallet parking and in first morning car wasn’t delivered on time. Room was dated especially bathroom tap not working properly and room was tucked into corner no view with morning noise. A bit disappointing for returning guests. Firstly, we were put on the 4th floor - looking straight onto the interior courtyard. I should have asked for a room on a higher floor. I will also try to remember to ask for a room facing out to the street. When we checked in I asked if we could receive a newspaper. I was told this was not usual but could get one. I asked for the Sunday mail - which wasn’t delivered on Sunday anyway. I thought Accor members could get a paper, but perhaps I am misguided here. I rang reception and guest services answered. I asked for someone to come and look at our air conditioner as the fan was quite noisy. We went out and on the way back to the room I asked if the air conditioner had been looked at. Reception had no record of this request being made so we asked again for it to be looked at. I am still not sure if it was as we were out a lot and we just ended up turning the fan off. The room was quite tired, 415 I think?? The sofa and chair upholstery is peeling and the bathroom door looked as if it had a lot of water damage. We have stayed at the Pullman at least 6 times and this would be the worst room we have had. We will try it again as we love the location. The parking fee of $50 is just unbelievable!!!! We parked over at King George Square which is perhaps what the Hotel wants as indicated by the high parking fee. Breakfast was ok. Buffets always seem challenged to have the food hot. The coffee was terrible, even the espresso was lukewarm. Staying with your hotel was fine, however having to pay for Wifi in this day and age is disappointing! I note other hotels dont charge so I would stay else where in future based on that. Had to change my room which I never do. I was looking forward to my stay having just returned from a Pullman in Brisbane across the road from the Town Hall which was a cut above my usual hotel experience. Their rooms were economical but also large and very clean - they even included excellent Barista coffee in the buffet breakfast. The room I booked in Melbourne was over $200 per night and described as park view. I was given a room on the third floor that looked onto a the roof of the foyer, the road and train tracks with some minimal view to the park over the road. The third floor and the room smelt musty and I started sneezing as soon as I entered. Staying for business. Close to where I was staying. I was very pleased with the rooms décor and layout. Bed was very comfortable. However, a few small items let down the experience. The balcony door wasn't sealing well and let in noise from the roadway. A few maintenance issues. The toilet cistern was constantly running. The steam iron worked, though didn't produce any steam. it was overall good but noisy due to construction outsode my window. The customer service was fantastic, motel is beautifully designed and decorated. Although, wasn't 100% impressed with the cleanliness of the bathrooms in particular. We were on on level 4 I think in one of the conference rooms and there were used soaps and the hand towels didn't appear to be clean in the suite next to the stairs. All food was amazing also! Had a lovely stay at the Pullman Brisbane, from being greeted at the door, to friendly check in, great spacious room with a yummy treat and welcome note waiting for us. Enjoyed a drink in the bar, and breakfast in the morning. Everything was lovely. Thank you. Staff were very helpful with extra help when an extra night was requested. Car Valet Service was wonderful and always on time when car needed. Restaurant was excellent. All Staff were very professional and friendly. Thank you for your feedback LindaB1058. It is great to hear that you enjoyed your time with us. The staff are always pleasant and well presented, restaurant & bar pleasant and great selection. Rooms are nice and tasteful always the bathrooms are tired and need attention.